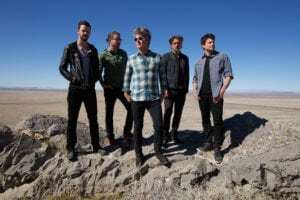 Collective Soul hit the ground running after their first song “Shine” took off back in 1993, and they haven’t looked back since. Signing with Atlantic Records and going double-platinum with their debut album, touring across North America, going triple-platinum with their second album, charting on Billboard with the singles “December,” “Where the River Flows,” “The World I Know,” “Gel,” and “Smashing Young Man,” Collective Soul continues to rock the masses nearly 25 years later. With a sold-out show coming up at The Coach House May 6, the band is looking forward to a special night. It’s not part of a tour, they just happened to be coming near the area and were looking for a place to play. “Our agent and our manager said this room would be a cool room to go play and to just have fun for a night kind of thing,” Turpin said. “We heard it was a cool, hip spot. One of the things Turpin enjoys about playing live is the energy transfer between the band and the crowd. The give and take. Fans have often commented that Collective Soul has a rawer, rockier sound when playing live than what comes across on record. “Yea, and I would say we are kind of like a studio band,” Turpin agreed. “We all kind of grew up in the studio. My father owns a recording studio that we all cut our teeth in. So, I think Collective Soul does have a tendency to make things sound really polished, I’d say, in the studio. “But live we embrace sounding more rockin’, more raw. It’s something we’re definitely aware of and for us it’s something we dig, too. It’s not that we should necessarily change what we do in the studio it’s just that “live” is different than “the studio”. A new album, a double album, is in the works that will be released in 2019. While recording new music last year, the group realized they were approaching their 25-year anniversary so decided to wait to release the new material. “We had more tunes, so we just thought ‘let’s don’t release a record this year, let’s just take our time, record 10 more songs, and release a double album and promote it for our 25 years,” Turpin reasoned. This coming summer, Collective Soul will embark on the Rock & Roll Express Tour with 3 Doors Down and Soul Asylum. But first, there’s the unique show coming to The Coach House.